And let me adde, that he that throughly understands the nature of Ferments and Fermentations, shall probably be much better able than he that Ignores them, to give a fair account of divers Phænomena of severall diseases (as well Feavers and others) which will perhaps be never throughly understood, without an insight into the doctrine of Fermentation. Essay 2, 'Offering some Particulars relating to the Pathologicall Part of Physick', in the Second Part of Some Considerations Touching The Usefulnesse of Naturall Philosophy (1663, 1664), 43. Break the chains of your prejudices and take up the torch of experience, and you will honour nature in the way she deserves, instead of drawing derogatory conclusions from the ignorance in which she has left you. Simply open your eyes and ignore what you cannot understand, and you will see that a labourer whose mind and knowledge extend no further than the edges of his furrow is no different essentially from the greatest genius, as would have been proved by dissecting the brains of Descartes and Newton; you will be convinced that the imbecile or the idiot are animals in human form, in the same way as the clever ape is a little man in another form; and that, since everything depends absolutely on differences in organisation, a well-constructed animal who has learnt astronomy can predict an eclipse, as he can predict recovery or death when his genius and good eyesight have benefited from some time at the school of Hippocrates and at patients' bedsides. Machine Man (1747), in Ann Thomson (ed. ), Machine Man and Other Writings (1996), 38. Concentrate only on the achievements, and ignore the mistakes. When judging a mathematician you should only integrate f+ (the positive part of his function) and ignore the negative part. Perhaps this should apply more generally to all evaluations of your fellow men. On his philosophy of writing letters of recommendation. As given in essay, Ronald Coifman and Robert S. Strichartz, 'The School of Antoni Zygmund', collected in Peter Duren (ed. ), A Century of Mathematics in America (1989), 348. The authors acknowledge students of Zygmund provided personal recollections to them for the essay in general. Webmaster speculates the quote is from a student recollection, and not necessarily verbatim. Courage is the ability to ignore your options. In The Well-Spoken Thesaurus (2011). Create a vision and never let the environment, other people’s beliefs, or the limits of what has been done in the past shape your decisions. Ignore conventional wisdom. Differences between individuals are the raw materials for evolutionary change and for the evolution of adaptations, yet of course most physiologists treat these differences as noise that is to be filtered out. From the standpoint of physiological ecology, the traditional emphasis of physiologists on central tendencies rather than on variance has some unhappy consequences. Variation is not just noise; it is also the stuff of evolution and a central attribute of living systems. The physiological differences between individuals in the same species or population, and also the patterns of variation in different groups, must not be ignored. Given any rule, however “fundamental” or “necessary” for science, there are always circumstances when it is advisable not only to ignore the rule, but to adopt its opposite. For example, there are circumstances when it is advisable to introduce, elaborate and defend ad hoc hypotheses, or hypotheses which contradict well-established and generally accepted experimental results, or hypotheses whose content is smaller than the content of the existing and empirically adequate alternative, or self-inconsistent hypotheses, and so on. Against Method: Outline of an Anarchistic Theory of Knowledge (1975, 1993), 14-15. Here’s to the crazy ones. The misfits. The rebels. The troublemakers. The round heads in the square holes. The ones who see things differently. They’re not fond of rules. You can quote them. Disagree with them. Glorify or vilify them. But the only thing you can’t do is ignore them. Because they change things. They push the human race forward. And while some may see them as the crazy ones, we see genius. Because the people who are crazy enough to think they can change the world, are the ones who do. In Apple Computer newspaper advertisement (1997) as quoted and cited in Tad Lathrop and Jim Pettigrew, This Business of Music Marketing and Promotion (1999), 55. I am not ... asserting that humans are either genial or aggressive by inborn biological necessity. Obviously, both kindness and violence lie with in the bounds of our nature because we perpetrate both, in spades. I only advance a structural claim that social stability rules nearly all the time and must be based on an overwhelmingly predominant (but tragically ignored) frequency of genial acts, and that geniality is therefore our usual and preferred response nearly all the time ... The center of human nature is rooted in ten thousand ordinary acts of kindness that define our days. If one in twenty does not seem high enough odds, we may, if we prefer it, draw the line at one in fifty (the 2 per cent. point), or one in a hundred (the 1 per cent. point). Personally, the writer prefers to set a low standard of significance at the 5 per cent. point, and ignore entirely all results which fail to reach this level. A scientific fact should be regarded as experimentally established only if a properly designed experiment rarely fails to give this level of significance. 'The Arrangement of Field Experiments', The Journal of the Ministry of Agriculture, 1926, 33, 504. If physical science is dangerous, as I have said, it is dangerous because it necessarily ignores the idea of moral evil; but literature is open to the more grievous imputation of recognizing and understanding it too well. In 'Duties of the Church Towards Knowledge', The Idea of a University Defined and Illustrated (1852, 1873), Discourse 9, 229. If there is a lesson in our story it is that the manipulation, according to strictly self-consistent rules, of a set of symbols representing one single aspect of the phenomena may produce correct, verifiable predictions, and yet completely ignore all other aspects whose ensemble constitutes reality. In 'Epilogue', The Sleepwalkers: A History of Man’s Changing Vision of the Universe (1959, 1968), 533. In The Roving Mind (1983), 26. It is baffling, I must say, that in our modern world we have such blind trust in science and technology that we all accept what science tells us about everything—until, that is, it comes to climate science. All of a sudden, and with a barrage of sheer intimidation, we are told by powerful groups of deniers that the scientists are wrong and we must abandon all our faith in so much overwhelming scientific evidence. So thank goodness for our young entrepreneurs here this evening, who have the far-sightedness and confidence in what they know is happening to ignore the headless chicken brigade and do something practical to help. Speech, awards ceremony for green entrepreneurs, Buckingham Palace (30 Jan 2014). As quoted in Benn Quinn, 'Climate Change Sceptics are ‘Headless Chickens’, Says Prince Charles', The Guardian (31 Jan 2014). It is India that gave us the ingenious method of expressing all numbers by means of ten symbols, each symbol receiving a value of position as well as an absolute value; a profound and important idea which appears so simple to us now that we ignore its true merit. But its very simplicity and the great ease which it has lent to computations put our arithmetic in the first rank of useful inventions; and we shall appreciate the grandeur of the achievement the more when we remember that it escaped the genius of Archimedes and Apollonius, two of the greatest men produced by antiquity. Quoted in Return to Mathematical Circles H. Eves (Boston 1988). It sometimes strikes me that the whole of science is a piece of impudence; that nature can afford to ignore our impertinent interference. If our monkey mischief should ever reach the point of blowing up the earth by decomposing an atom, and even annihilated the sun himself, I cannot really suppose that the universe would turn a hair. The Confessions of Aleister Crowley, ch. 14 (1929, rev 1970). It takes many years of training to ignore the obvious. In The Economist (18 Nov 1898), 77. As quoted and cited in Robert G. Evans, 'Health Care as a Threat to Health: Defense, Opulence, and the Social Environment', Daedalus (Fall 1994), 124, No. 123, 22 & Note 1 on p.40. Knowledge is indivisible. When people grow wise in one direction, they are sure to make it easier for themselves to grow wise in other directions as well. On the other hand, when they split up knowledge, concentrate on their own field, and scorn and ignore other fields, they grow less wise–even in their own field. In The Roving Mind (1983), 116. Leave the beaten track occasionally and dive into the woods. Every time you do so you will be certain to find something that you have never seen before. Of course, it will be a little thing, but do not ignore it. Follow it up, explore all around it: one discovery will lead to another, and before you know it, you will have something worth thinking about to occupy your mind. All really big discoveries are the results of thought. Address (22 May 1914) to the graduating class of the Friends’ School, Washington, D.C. Printed in 'Discovery and Invention', The National Geographic Magazine (1914), 25, 650. Mythology is wondrous, a balm for the soul. But its problems cannot be ignored. At worst, it buys inspiration at the price of physical impossibility ... At best, it purveys the same myopic view of history that made this most fascinating subject so boring and misleading in grade school as a sequential take of monarchs and battles. No one has a sorrier lot than the weatherman. He is ignored when he is right, but execrated when he is wrong. Epigraph in Isaac Asimov’s Book of Science and Nature Quotations (1988), 151. One cannot ignore half of life for the purposes of science, and then claim that the results of science give a full and adequate picture of the meaning of life. All discussions of “life” which begin with a description of man's place on a speck of matter in space, in an endless evolutionary scale, are bound to be half-measures, because they leave out most of the experiences which are important to use as human beings. In Religion and the Rebel (1957), 309. 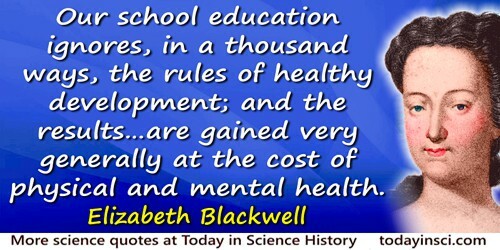 Our school education ignores, in a thousand ways, the rules of healthy development; and the results … are gained very generally at the cost of physical and mental health. Psychological experiments have shown … that humans tend to seek out even weak evidence to support their existing beliefs, and to ignore evidence that undercuts those beliefs. In the process, we apply stringent tests to evidence we don't want to hear, while letting slide uncritically into our minds any information that suits our needs. As co-author with Kathleen Hall Jamieson, in unSpun: Finding Facts in a World of Disinformation (2007), 69-70. Round about the accredited and orderly facts of every science there ever floats a sort of dust-cloud of exceptional observations, of occurrences minute and irregular and seldom met with, which it always proves more easy to ignore than to attend to … Anyone will renovate his science who will steadily look after the irregular phenomena, and when science is renewed, its new formulas often have more of the voice of the exceptions in them than of what were supposed to be the rules. In 'The Hidden Self', Scribner’s Magazine (1890), Vol. 7, 361. Round about the accredited and orderly facts of every science there ever floats a sort of dustcloud of exceptional observations, of occurrences minute and irregular and seldom met with, which it always proves more easy to ignore than to attend to. The Fractal Geometry of Nature (1977, 1983), 28. 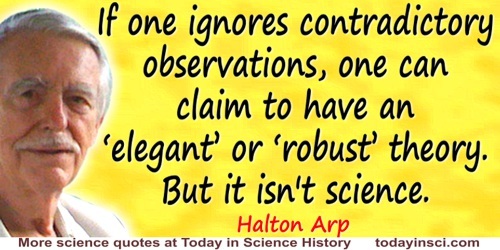 Science proceeds more by what it has learned to ignore than what it takes into account. Science that jumps to measurement too soon is as unsound as science that ignore measurement too long. From Jacob Morton Braude, Speaker's Desk Book of Quips, Quotes, & Anecdotes (1966), 295. Also in Science Digest (1954), 36, 55. The function of ignoring, of inattention, is as vital a factor in mental progress as the function of attention itself. In The Principles of Psychology (1918), Vol. 2, 371. The history of civilization proves beyond doubt just how sterile the repeated attempts of metaphysics to guess at nature’s laws have been. Instead, there is every reason to believe that when the human intellect ignores reality and concentrates within, it can no longer explain the simplest inner workings of life’s machinery or of the world around us. From Reglas y Consejos sobre Investigacíon Cientifica: Los tónicos de la voluntad. (1897), as translated by Neely and Larry W. Swanson, in Advice for a Young Investigator (1999), 2. The simple and plain fact is that the scientific method wins its success by ignoring parts of reality as given in experience; it is perfectly right to do this for its own purposes; but it must not be permitted by a kind of bluff to create the impression that what it ignores is non-existent. In Nature, Man and God: Being the Gifford Lectures Delivered in the University of Glasgow in the Academical Years 1932-1933 and 1933-1934 (1934), 51. There is a moral or metaphysical part of nature as well as a physical. A man who denies this is deep in the mire of folly. ’Tis the crown and glory of organic science that it does through final cause, link material and moral; and yet does not allow us to mingle them in our first conception of laws, and our classification of such laws, whether we consider one side of nature or the other. You have ignored this link; and, if I do not mistake your meaning, you have done your best in one or two pregnant cases to break it. Were it possible (which, thank God, it is not) to break it, humanity, in my mind, would suffer a damage that might brutalize it, and sink the human race into a lower grade of degradation than any into which it has fallen since its written records tell us of its history. Letter to Charles Darwin (Nov 1859). In Charles Darwin and Francis Darwin (ed. ), Charles Darwin: His Life Told in an Autobiographical Chapter, and in a Selected Series of His Published Letters (1892), 217. We should like Nature to go no further; we should like it to be finite, like our mind; but this is to ignore the greatness and majesty of the Author of things. Letter to S. Clarke, 1715. Trans. M. Morris and G. H. R. Parkinson, Leibniz: PhilosophicalWritings (1973), 220. When Big Bang proponents make assertions such as … “the evidence taken together … hangs together beautifully,” they overlook observational facts that have been piling up for 25 years and that have now become overwhelming. Of course, if one ignores contradictory observations, one can claim to have an “elegant” or “robust” theory. But it isn’t science. You have to have a lot of ideas. First, if you want to make discoveries, it’s a good thing to have good ideas. And second, you have to have a sort of sixth sense—the result of judgment and experience—which ideas are worth following up. I seem to have the first thing, a lot of ideas, and I also seem to have good judgment as to which are the bad ideas that I should just ignore, and the good ones, that I’d better follow up. As quoted by Nancy Rouchette, The Journal of NIH Research (Jul 1990), 2, 63. Reprinted in Linus Pauling, Barclay Kamb, Linus Pauling: Selected Scientific Papers, Vol. 2, Biomolecular Sciences (2001), 1101. You’ve got to be fairly solemn [about the environment]. 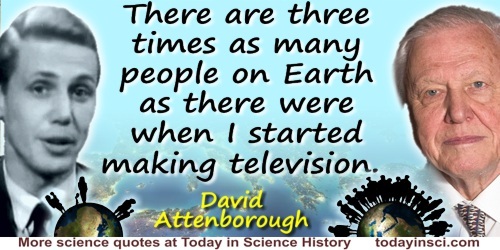 I mean the mere notion that there are three times as many people on Earth as there were when I started making television. How can the Earth accommodate them? When people, including politicians, set their faces against looking at the consequences—it’s just unbelievable that anyone could ignore it. 'Sir David Attenborough interview' (aged 84), by Andrew Pettie in The Telegraph (23 Dec 2010). [John Scott Haldane] preferred to work on himself or other human beings who were sufficiently interested in the work to ignore pain or fear … [His] object was not to achieve this state of [pain or fear] but to achieve knowledge which could save other men's lives. His attitute was much more like a good soldier who will risk his life and endure wounds in order to gain victory than that of an ascetic who deliberately undergoes pain. The soldier does not get himself wounded deliberately, and my father did not seek pain in his work though he greeted pain which would have made some people writhe or groan, with laughter. In R.W. Clark, JBS: The Life and Work of J.B.S. Haldane (1968), quoted in Lawrence K. Altman, Who Goes First? (1986), 215. “Any specialty, if important, is too important to be left to the specialists.” After all, the specialist cannot function unless he concentrates more or less entirely on his specialty and, in doing so, he will ignore the vast universe lying outside and miss important elements that ought to help guide his judgment. He therefore needs the help of the nonspecialist, who, while relying on the specialist for key information, can yet supply the necessary judgment based on everything else… Science, therefore, has become too important to be left to the scientists.